First and foremost, I am an ALDUB fan. Just to make it clear. But I am also an MMFF fan. Every year, I make sure I watch as much movies as I can. Suporta sa pelikulang Pilipino. So this review is from someone who loves movies in general but also adores the ALDUB loveteam. Klaro?! 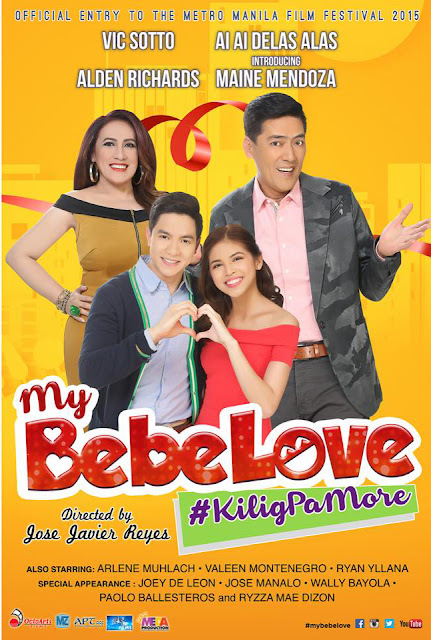 My Bebe Love is a feel-good movie. When I attended the blogcon last month, Direk Joey himself said that this film is not an award-worthy film. It’s just a feel good, kilig movie. No brainer. Easy follow storyline. So I went to the cinema expecting nothing but that. And I went home happy and satisfied because I got what I expected. My Bebe Love obviously tapped on the ALDUB chemistry and inserted it into the film. I wished they made more kilig scenes but I understand that the decision to insert the ALDUB love team came in late into the game and they had already submitted the initial storyline to the MMFF committee so they can’t really change much. I love Maine Mendoza! The girl can act. For a newbie actress, she delivered with flying colors. Way better than the others na ang tagal tagal na eh hindi padin makaarte ng maayos. Hihihi! My husband says nainis sya kay Maine on this film, eh well! I guess that’s a testament of how good she is. Bratinellang rich kid ang role nya, may nakakatuwa bang bratinella? But seriously, and I am not saying this because I love Maine, she could really act and she’s really good in this film. But I still think she doesn’t deserve that Best Supporting Actress trophy. Kahit sya hindi nya alam bakit sya nanalo eh. Aminado naman sya. Harhar! MMFF, anong trip to?! I wish though that they used Alden’s strength and played it well on this film. Kulang eh. Sayang his charm and galing sa pag arte. Though again, Direk Joey said that they we’re limited by the fact that they can’t change the story much. On the next movie nalang ng ALDUB please!!! Now on to the AiSsing!! This film is definitely a Bossing-AiAi film and they made sure of that. I love the different Bossing here. Rich. Refined. Subtle. No more poor Bossing na ala-Enteng Kabisote. I love it. And his porma! Wow ah! Kudos to the stylist. This is such a refreshing Bossing. More roles like this for him. Though I hope that they also changed AiAi’s role. I mean, I read on a lot of reviews na ang ingay ingay daw ni AiAi. And I can’t help but agree. Loud outfit. Loud character. Parang too much lang. Sana they made her this strict old maid. Parang yung role ni Regine Velasquez sa Ikaw Lamang, Hanggang Ngayon. That postal office girl na old maid na parang pinagbagsakan ng langit at lupa. That could have been a great take on this film diba? Rather than the loud and colorful Corazon. Oh well, sige na! Ako na pakielamera. Nyahahaha! Anyway, the AiSsing chemistry is overflowing. Funny but I got really kilig with them. Especially on that jeepney, post-one-night-stand scene. Wonderful. I just hope that movies now would stop making it like a commercial of some sorts. Naloloka na ko eh. Although pinakamalala padin yung sa My Little Bossings at Praybeyt Benjamin. Atleast here, they tried to really inject the brands onto the film’s storyline. Hindi masyadong off. But nonetheless, I hope they’d stop it. Or make it subtle guys. Please. All in all I had fun. And the kids watching with me at the cinema surely had fun too. Just make sure you set your expectations right. Medyo I really find it weird that some “movie critic” would criticize this film and look for substance and all. They would say, gusto lang kumita. Eh hello? Sino bang pelikula ang ayaw kumita diba? Just make sure that you set your expectations right. I mean, this is a feel good movie. Yun na yun. And while I really understand the passionate movie buff who asks for more meaty movies, meron din kasing eto ang means of entertainment. Yung feel good lang na easy to follow film. Yung kilig lang because of ALDUB. Tawa lang because of Bossing. Paglabas mo ng sinehan, wala kang iisipin na cinematography and all. But I also ask for everyone to please support the movies din na may substance. Balance balance din pag may time. Actually, my next is Honor Thy Father. After a no-brainer kilig film, dun naman tayo sa may substance. Okay?